Kúðafljót glacial river forms the western border of the large moss-covered Skaftáreldahraun lava field. Here, highway no. 1 crosses the river via a long bridge. 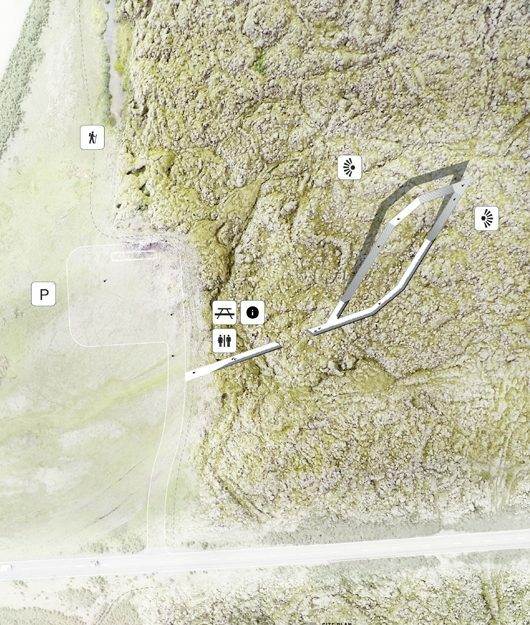 This particular spot is currently not designated as a point of interest or tourist attraction, however, it could potentially be an important site as it is the location where visitors get there first impression of the Skaftárhreppur landscape. Given that most visitors enter the area from the west (the capital area), this site could be well positioned to provide visitors with appropriate information about exploring the sensitive landscape during their visit. From this perspective, the site has the potential to function as the main gateway to Skaftárhreppur. 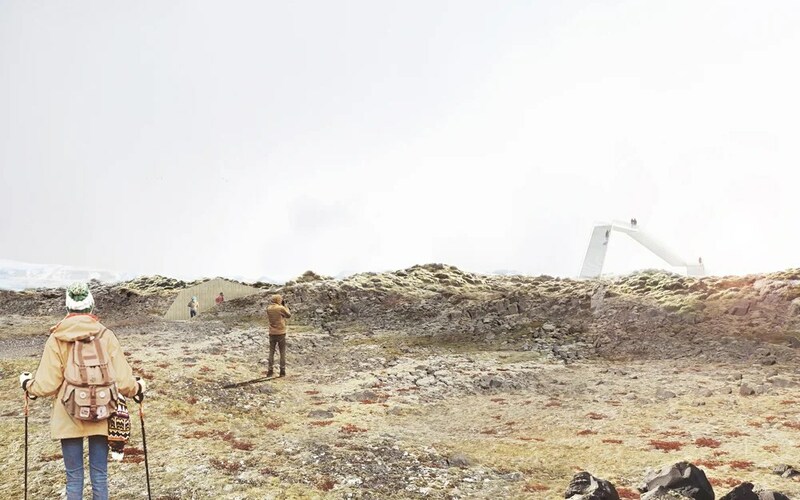 The proposed spatial intervention is to implement a cross-section through the edge of the lava field, with a pathway leading towards a stairway. The cross-section and pathway are designed as an experience within themselves. By cutting slightly through the lava field, visitors can experience the height of the lava and its loose texture as they walk through. The pathway is cut just a few meters deep through the lava and is protected by a retaining wall. This wall is fully integrated within the lava formation and provides space for information signs, communication and educational initiatives. Even facilities like a toilet and a basic visitor center could be integrated into this wall, avoiding additional negative visual impacts on the landscape. The route eventually ends at a stairway rising up from the lava field, at a maximum height of ten meters above the ground. The stairway offers views in many different directions and towards various points of interest. It includes views to the Katla volcano, the coastal zone with the black beach, the highlands, the lava fields and the glacial rivers. These vistas communicate the essence of the Skaftárhreppur landscape to the visitors. 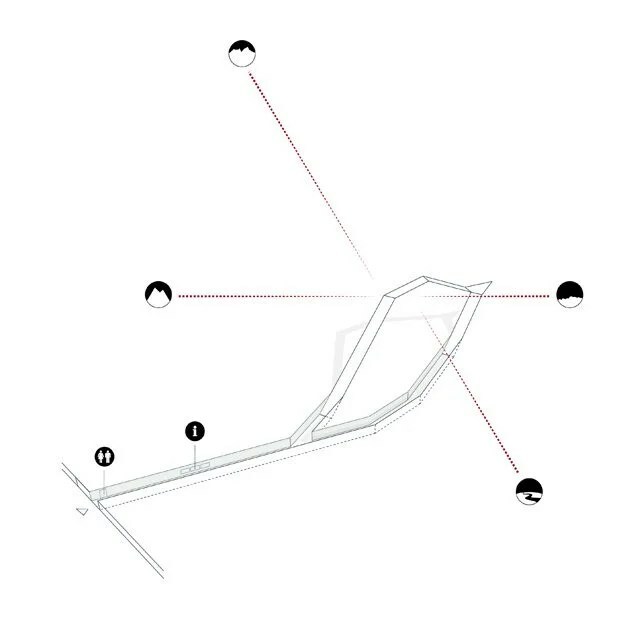 By incorporating the directions of these vistas into the design of the stairway, an edged and dynamic silhouette arises, constantly changing according to the position from which it is being viewed. 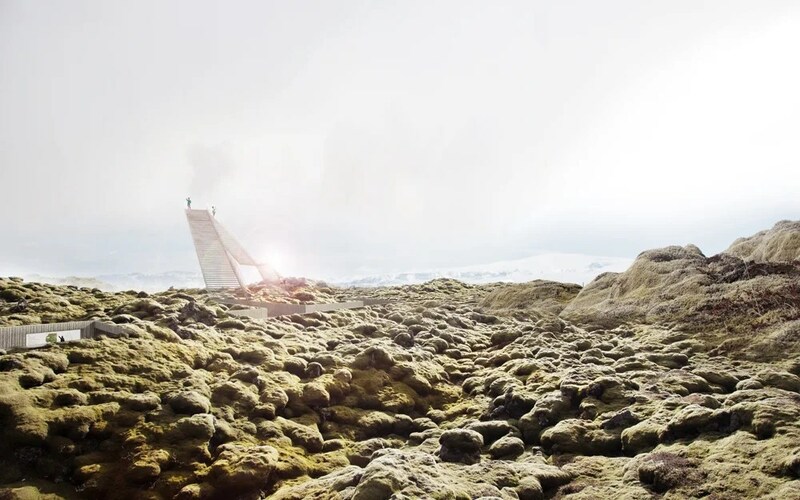 Due to the height differences and small hills in the lava field the visual impact of the stairway on the landscape will be minimal. The construction simply disappears from view, when passing by car.